Start Your Own 3-in-1 Automatic Directory Submission Service and Earn with Paypal. 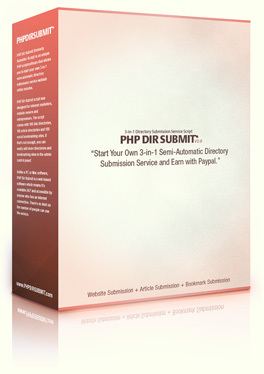 PHP Dir Submit, formerly Submitter Script, is a powerful and easy to use turnkey PHP script that allows you to start your own fully-automatic directory submission service online and earn with Paypal. Once installed, you will have a powerful and easy to use web-based SEO tool that anyone with an internet connection can use to submit websites, articles and bookmarks all in one place, quickly and effectively. If you choose to, you can use PHP Dir Submit as a directory submission software for submitting client websites. We have included 300 link directories, 300 article directories and 300 social bookmarking sites in the script so that you can get started right away. If that's not enough, you can easily add more of your own directories in the admin panel. All you need is a web server to run this powerful SEO script. If you already own a website, chances are you can just add another site without paying anything extra. What Can PHP Dir Submit Do For You? Start a profitable directory submission service business without paying the high cost. Build a list of potential customers for your business. Improve your current website's ranking on search engines like Google. Make your existing product or service more valuable. Offer affordable SEO services to your existing clients. Make your existing customers and visitors like you more, and tell their friends about you. What Makes PHP Dir Submit Unique? Unlike many other automatic directory submitters you see on the net, PHP Dir Submit allows you and your customers to submit websites, articles and bookmarks all in one place. PHP Dir Submit is not just another automatic directory submitter; it's a well researched turnkey SEO tool that made for internet marketers, small business owners and entrepreneurs. You can choose to use PHP Dir Submit to make money, improve the ranking of your (or your clients) website, attract more visitors or do all of these! We manually check and update the 900 preloaded directory sites every 3 months and all customers are able to get the updates free of charge. We would love to hear from you, feel free to send us your feedback. There has never been a better time to start your own directory submission service website and PHP Dir Submit will help you do it quickly, easily and affordably. The instructions for downloading the script files and manual will be sent to you immediately after the payment. We accept payments via Paypal. If you have any problem after the purchase, feel free to contact us. * The Single Site License can only be installed on 1 domain. ** The Multi Site License can be used on unlimted number of your personal domains. If you want to resell PHP Dir Submit powered sites or purchase for clients, please contact our support team for more information. *** All payments are handled by Paypal's secure server. You don't need to have a Paypal account to pay by credit cards.